Sometimes it feels like resistance towards new ways of doing things is encoded in the human DNA. Whether it is new technology or simply a slightly better method that’s been proven to be more effective, there is always a large number of people who will automatically judge the new method to be ineffective or problematic. Even if the new method would help them with their workload, save time or help them to be more successful. When an interview is conducted over the phone, both the recruiter and the candidate need to be available at the same time. This can obviously be overcome by scheduling an appointment for the interview ahead of time, but it still requires simultaneous availability of both parties. Another major time-related issue with phone interviewing is the fact that phone interviews are time-consuming. Ok, one interview might only take 30 minutes of recruiter's time, but what about when there are 20 potential candidates you would like to interview? Note: These numbers did not include possible scheduling conflicts, which you might face when scheduling a phone interview. 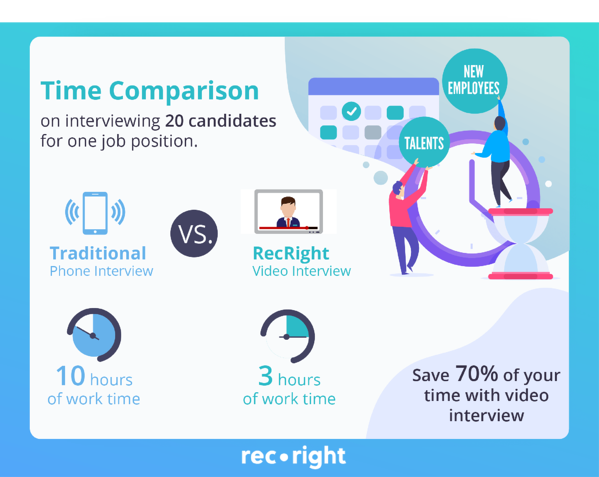 If you use an asynchronous video interviewing tool, recording your video questions for the candidates takes about an hour the most. After you have recorded your questions, you can copy and paste the candidates' email addresses and send your questions to them with a one single click. Let's say you have asked them three questions expecting relatively long, two-minute answers. Watching the candidates' replies would take 120 minutes. Optimizing processes and saving every possible dollar are guaranteed to be on every company's wish list so why are we still recruiting so inefficiently? …and 5 minutes later you realize that this candidate is not suitable for the job. Their personality just simply doesn’t fit the task or the team. Since you have scheduled a full hour for the interview, you will still interview them even though you know you are wasting your time. Sounds familiar? How about getting an immediate insight into the applicant's personality before wasting your time arranging an interview? This is when video interviewing is in the league of its own. Within minutes, you will have an indication on whether the candidate's personality fits what you are looking for or not. If you only read the CVs and conduct phone interviews, there will still be unavoidable courtesy calls for arranging face-to-face interviews. And as long as you stick with the old methods, the chances are that while you are counting down the minutes of another hour spent interviewing the wrong candidate, your competitor is using the time to their advantage. "I can't imagine going back to phone screening!" 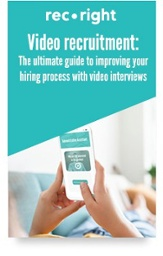 As a professional recruiter, with video interviewing you can easily pick out the best candidates who have both the talent and the personality you are looking for. You can also save the videos for future use if for example a candidate is a perfect match for a position that is not currently open. Recognising your future superstar has never been this easy – watch the videos and pick only the best candidates for the face-to-face interviews. Changing old habits is never easy, especially in larger corporations. And every time a new, more effective method comes along, there will always be pioneers who take advantage of it right away. Sadly, those who decide to stick with the old, accept the change only if they have to. For the latter group, remember to pick up some typewriter ink on the way home. Start saving your time by recruiting quality candidates – you won't regret it. 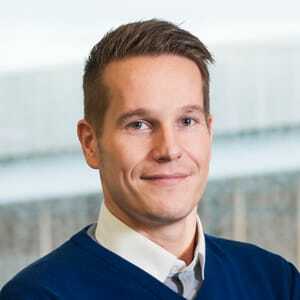 Read this next: Psychologist's opinion: How does video interviewing fit to recruitment processes?